Is the historical Adam a “Gospel” issue? | J.W. Wartick -"Always Have a Reason"
« Sunday Quote!- Is Natural Revelation Infallible? First you come up with your own definition of “gospel issue” and then you quote Barrick saying it’s a gospel issue and then suggest it’s not a gospel issue and, by implication, Barrick is wrong. But it’s porblematic that you don’t bother to ask whether Barrick’s understanding of when something is “a gospel issue” matches with your own stipulated definition. In fact, Barrick says “Let us be perfectly clear, however. One could argue that the historicity of Adam might not indicate anything about a person’s salvation. Perhaps a born-again believer could deny Adam’s historical existence without losing his or her saving relationship to Christ and everlasting forgiveness of sins . However, although it might not be a salvation issue , the matter is still a gospel issue, because it touches on matters related to our need for salvation (universal sin) and the ability of Jesus Christ to act as a representative and Savior for mankind (as the “second Adam”) and as the restorer of the fallen creation” (Kindle Loc. 1256-1260). So Barrick is not “Most telling for our question” when you’ve framed the question of “gospel issue” in terms of salvation. Second, you summarize Barrick’s position as “if no historical Adam lived and acted in the Fall, then what reason is there for Christ to come as the second Adam and restore humanity to God?” And this follows Lamoureux’s own summary of Barrick where he says “Barrick also contends that “without a historical first Adam there is no need for Jesus” (p. 197). He then concludes, “That makes the historicity of Adam a gospel issue[…]” (Kindle Loc. 4141-4142). 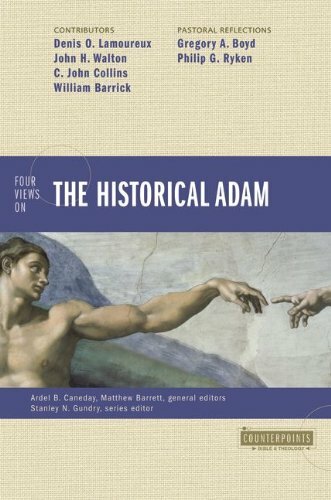 “John Mahoney articulates the matter in the following way: ‘If the first man is not historical and the fall into sin is not historical, then one begins to wonder why there is a need for our Lord to come and undo the work of the first man.’ That makes the historicity of Adam a gospel issue.” (Kindle Loc. 4044-4047). In other words, Barrick’s argument is that *the Bible* predicates Christ’s work as a response to what occurred as a result of the first man. And if you remove the first man, then you remove *the Bible’s* rational for Christ’s work. Of course you can substitute other figures which try to create the same need. For instance, maybe we postulate (based on new archeological evidence) that the fall occured not with Adam, the first man, but with Cain (the n’th man). In that case, we could still say that man needs redemption, but this is still a denial of what the Bible says is the rational for Christ’s work: Adam’s sin. Lamoureux actually has no response to Barrick’s point except to say that we should reject what Paul says as factual. But to point out that we can imagine lots of possible scenarios in which men need God’s rescuing is not actually responding to Barrick’s point. The reason I use a working definition for “Gospel Issue” is because I am not specifically saying only Barrick and Lamoureux’s views matter, but rather I’m using them as a foil to explore the question which is the title of this post. Thus, for me, there is no reason to absolutely adopt everything either one says, because I’m using them as a springboard for further discussion. The quote from John Mahoney is actually in this post, so I’m not sure why it seems as though you’re saying I’m misquoting or misstating Barrick’s position, particularly because for the sake of this post and in your own outline of Barrick’s position, we’re assuming the Bible is indeed how it happened! And of course I think that is true myself, so hypothetical situations are essentially an aside, as I hinted at when I set aside Lamoureux’s attempt to say that perhaps the Fall could have or did happen in some other way. Realistically, I don’t see where your comment shows my summary is mistaken at all, particularly because I’m critical of both Lamoureux and Barrick here. You are free to stipulate any definition of “gospel issue” you want. And if you want to adopt a certain definition because of a broad audience that makes perfect sense. But what doesn’t make sense is why you would settle upon a definition and then use someone who doesn’t take have that definition in mind (as Barrick clearly doesn’t) as your foil. It seems to me that if Adam is part of a metaphor (and there is compelling evidence this is the case), then his ‘sin’ is also metaphorical. To be consistent and use the same standard, this means we need to view the need for redemption to be a metaphorical need, so all we need is a metaphorical redeemer. If Jesus lived and died as most Christians believed, then it’s very strange to try to argue that an actual, literal, historical interventionist god undergoing a literal, historical blood sacrifice is a necessary response to this metaphor. If this justification for torture and painful death were used by anyone else for responding to any other similar metaphor, we’d call that person crazy because of the obvious disconnect with reality and dismiss such a sacrifice not only as unnecessary but evidence of profound mental illness. If there was no historical Adam then a theology of the Gospel built on Adam is mistaken and needs to be rethought. But Adam never features in any of the Gospel presentations in Acts, or in Paul’s summaries of the message he preached in his epistles, 1Cor 15:3 that Christ died for our sins in accordance with the Scriptures, 4 that he was buried, that he was raised on the third day in accordance with the Scriptures, If a historical Adam is intrinsic to the gospel, why was it never preached as part of the gospel? A historical Adam is part of the Augustinian theodicy the traditional explanation of why we needed to be saved in the first place, but not of the scriptural message of Christ saving people who are in fact sinners. I am not sure Christ being the second Adam requires a literal first Adam and more than him being the Good Shepherd who lays down his life for his sheep needs a literal shepherd who actually died for a flock of woolly ungulates. But the traditional understanding of Adam has bigger problems than the question of Adam’s historicity. Our understanding of the Fall and Original Sin is based on Augustine’s misinterpretation of Romans 5:12 that we somehow sinned in Adam. That’s not what the passage says even if you interpret Paul as writing literally. It says that death, Adam’s sentence, spread to all men because we all sinned too, it does not say Adam’s sin or his sin nature was passed down to us. But I disagree with Lamoureux here, I don’t think Paul was speaking of Adam historically. Paul may have thought of Adam as a historical person, but he was interpreting him figuratively as an allegorical picture of Christ, Rom 5:15 Adam was a figure of one who was to come. If Paul’s teaching about Adam was allegorical then Adam’s historicity doesn’t make a difference to Paul’s teaching since his point was based on the picture of Adam not a historical fact. It does mean that any theology that is based on the historicity of a passage that is speaking allegorically needs some serious rethinking. Lamoureux assumes Paul must have taken Adam historically because it was the scientific understanding of the origin of the human race. But first century Jews Philo and Josephus thought the story of Adam and Eve was written as allegory. If Paul also interpreted Adam allegorically, (Rom 5:14) there is no reason he wouldn’t have shared Philo and Josephus’s view that the story was written as an allegory. Is the historical Adam a “Gospel” issue ? It features in Paul’s presentation of the gospel in Romans 5. If a historical Adam is intrinsic to the gospel, why was it never preached as part of the gospel? Isn’t it a fundy view of Scripture to think that we have verbatim what Paul preached in Acts or the Epistles? What we have are summaries. We know the gist of what Paul and others said, not all that they said. Perhaps sometimes Paul did present Adam, same as he does in Romans 5. But anyway, no one claims Adam is “intrinsic to the gospel”. Christ being the good shepherd is a metaphor based on actual shepherds who may lay down their life for their sheep (think of David fighting against the lion, for instance). So we have a metaphor based on actual events. But it looks like in your case you want a metaphor based on a metaphor (Christ is a second Adam metaphorically grounded in a first metaphorical Adam). So it’s metaphors all the way down and one has to wonder why anyone bothered with such a metaphor in the first place if they never believed it and it had no correspondence to reality the way the good shepherd does. Augustine’s misinterpretation of Romans 5:12 that we somehow sinned in Adam. That’s not what the passage says even if you interpret Paul as writing literally. It says that death, Adam’s sentence, spread to all men because we all sinned too, it does not say Adam’s sin or his sin nature was passed down to us. Read more than verse 12: “many died through one man’s trespass,” (vs. 15) “one trespass led to condemnation for all men” (vs. 18). And it’s quite silly to try and pin this on “Augustine” as though anyone who takes the interpretation that we sinned in Adam is doing so just because they are following Augustine. Very strong *exegetical* arguments have been given in support of such a reading, wholly apart from what Augustine said (cf. for instance, Reymond’s ST around p. 689). This modus operandi is akin to those who try to dismiss the notion of a soul or substance dualism by noting that “It’s Greek.” Sorry, but that’s not a serious way to engage an opposing view. Engage the arguments instead of waving off it’s supposed origins. No, he wasn’t. Paul pictures Christ as a SECOND Adam, he doesn’t picture Adam as Christ. Rom 5:15 Adam was a figure of one who was to come. That’s verse 14, and the text says Adam was typological of Christ, insofar as he is the federal head of man. This is where the parallel ends and why Paul presents Christ as a *second Adam* but not as Adam per se. But nothing in that entails or even hints that the first Adam is not a historical person, anymore than the events of the Israelite wilderness wanderings being a “type” for us indicates that the events never actually happened (1. Cor. 10:11, the word sometimes translated “example” is “typikos”). or anymore than the law and the temple being typological of the heavenly realities means there was never a literal law or temple in history. It does mean that any theology that is based on the historicity of a passage that is speaking allegorically needs some serious rethinking. Except Romans 5:14 doesn’t talk about Adam as an allegory, but as a type and clearly the Biblical writers thought types were historically rooted (I gave two examples, you can find others just by looking up the Greek word “typos” in the Theological Dictionary of the New Testament). So you’ve actually not given us any reason to think Adam is not a historical figure (unless one things “Scripture must be saying whatever science says” is a valid reason…). Romans is a long theological exposition sent to a church rather than the Gospel presentation Paul preached to non Christians. Acts may not be verbatim but the description of the messages preached is the writer’s view of the core points of the different apostles’ messages. It seems very odd that the message about Adam would be essential to the gospel yet is somehow missed out in every description of the Gospel being preached. The bible has metaphorical pictures that have no basis in reality: winged leopards, seven headed dragons. Verse 12 with all its very prepositions is much more specific than verse 15 which simply used the dative which can mean anything from a dative of reference to an instrumental dative. Paul gives the cause of us dying in verse 12, “because all sinned”, there is no reason to read verse 15 as any more than associating our death with Adam’s whose sentence we share because we sinned too. Similarly there is no verb ‘led to’ in verse 18. Paul tracks the series of event without ascribing cause. Cause is found in verse 12. Why do you say ‘no he wasn’t’ and then quote verse where Paul says he does? There is no ‘insofar as’. Paul says that he saw Adam as a typological/figurative picture of Christ. You can’t limit the allegorical meaning to federal head, especially when Paul never describes Adam as federal head. We need to look at Paul writings to see the sorts of comparisons he makes between Adam and Christ. Since Paul brings up Adam as a figure of Christ in Romans 5 what specific comparison is he referring to? The whole of this passage from verse 12 to the end is one long comparison of Adam and Christ. Without any other obvious explanation in the text of the figurative meaning he was referring to, the most obvious meaning is the whole passage is figuratively comparing Adam and Christ. The idea that a types tupoi in the bible are all historically rooted comes from rules of typology formulated by church fathers (based on the assumption all the types use in the NT were historical). But that is not how tupos was used before these rules were established. If we look at the Shepherd of Hermas, tupos was used to describe the apocalyptic visions. Philo used tupos to describe his highly allegorical interpretation of Adam and Eve, who he didn’t regard as historical. We should base our understanding of tupos on how it was used in Paul’s time, not rules of typology thought up later. No, I’m simply showing you can’t take Romans 5 as evidence Paul thought Adam was historical, and that if Paul was speaking figuratively in Romans 5, then trying to read the passage literally misunderstands what Paul was saying. No, science only shows us interpretations that are mistaken it doesn’t tell us how to read the text. But science hasn’t told there wasn’t a historical Adam, the federal head interpretation has no problem fitting evolution. What I doing is simply looking at a text. Romans is a long theological exposition sent to a church rather than the Gospel presentation Paul preached to non Christians. You say this as though it’s supposed to provide me with some relevant response… But it doesn’t. Fact is, it features in Paul’s discussion of the Gospel in Romans 5. That Paul isn’t addressing unbelievers in Romans 5 is quite irrelevant. It seems very odd that the message about Adam would be essential to the gospel yet is somehow missed out in every description of the Gospel being preached. First, who claimed it was “essential to the gospel”? Exactly who are you trying to refute here? Second, when you make statements like “intrinsic to the gospel” or “essential to the gospel” what exactly are you talking about? Second, Paul didn’t miss it in Romans 5. Even if that’s the case, so what? Did anyone here say every metaphor has a concrete counter-part? You seem to have a habit of swinging at imaginary targets. But anyway, winged leopards and seven headed dragons do refer to actual, historical counter-parts: the nations they refer to. At some point, the metaphor reflects a reality, a real space-time event or thing. But you have a metaphor simply mirroring another metaphor. Verse 12 doesn’t select for “we die because of our sins.” So even if the cause is found in verse 12, that doesn’t favor your reading per se. Verse 12 is ambiguous enough that the federal headship reading is a legitimate option: because all sinned in Adam. The rest of the context makes it abundantly clear that it is in fact because all sinned in Adam. Again, other scholars have exegeted this much more capable than I (cf. John Murray, Douglas Moo, John Piper, etc.) To say there is no cause ascribed is simply false. The ONE trespass is clearly thought to be the cause of the many dying and the condemnation. What arguments have you seen? Who are the people you’re referring to? False. The passage you’re referring to by Reymond says “But because God’s justifying activity modifies the “all sinned” of 3:23 (which, in light of the occurrence of the same phrase in Romans 5:12, doubtless includes the imputation of Adam’s sin to all mankind descending from him by ordinary generation), it would follow that Christ’s cross work is as extensive in its intended provision as man’s sinful condition.” Clearly Reymond isn’t even attempting to make an exegetical argument at this point. So he’s not starting with his conclusion. Rather he makes a parenthetical observation that, given his reading of Rom. 5:12 which he argues for elsewhere, Paul “doubtless includes” the same idea given that he’s using the same phraseology. Can you not bring yourself to interact honestly with the dialogue? You said Paul thinks Adam is an allegorical picture of Christ. I said no, he pictures Christ as a second Adam and then pointed out that Adam is typological only in respect to his federal headship. There is no ‘insofar as’. Yes there is. Paul draws a contrast between Adam and Christ at every point except their federal headship. You can’t limit the allegorical meaning to federal head, especially when Paul never describes Adam as federal head. The text doesn’t say Adam is an allegory. That’s you reading your own conclusion into the text. It says Adam is a type and the only parallel hinted at in the text is the federal headship. The emphasis is on how Christ and his work is dissimilar to Adam and his work. Since Paul brings up Adam as a figure of Christ in Romans 5 what specific comparison is he referring to? The whole of this passage from verse 12 to the end is one long comparison of Adam and Christ. Without any other obvious explanation in the text of the figurative meaning he was referring to, the most obvious meaning is the whole passage is figuratively comparing Adam and Christ. No, it’s not one long comparison in the sense that Adam is like Christ. Rather, it’s one long contrast. The idea that a types tupoi in the bible are all historically rooted comes from rules of typology formulated by church fathers (based on the assumption all the types use in the NT were historical). You have a habit of trying to knock down an idea by hand-waving its origins. And you’re back to shadow boxing. Who said types “are all historically rooted”? Suppose that not all types are historically rooted. So what? I only pointed out that types in Scripture can be historical realities; thus, pointing out that Adam is a type does absolutely nothing to suggest Adam wasn’t a historical reality. Trying to respond to me with “Well not all types are historical!” does nothing to address my point. If we look at the Shepherd of Hermas, tupos was used to describe the apocalyptic visions. Philo used tupos to describe his highly allegorical interpretation of Adam and Eve, who he didn’t regard as historical. We should base our understanding of tupos on how it was used in Paul’s time, not rules of typology thought up later. Scripture is our primary point of reference in these matters, not Philo or apocrypha. Your hermenuetics is always telling: Scripture can’t say what Science tells us it can’t say, turn to Philo to interpret Paul. And no one here mentioned *rules of typology* here did they? Nope… more shadowboxing. You give a false appearance of defeating your opponent by knocking down all these straw-men. All I did was appeal to some Scripture passages which mention types and point you to the TDNT (which also doesn’t insist on any rules). Where did you show that? What exactly is supposed to show that? It can’t be the fact that Adam is a type, since that doesn’t show us anything of the sort. No, science only shows us interpretations that are mistaken it doesn’t tell us how to read the text. Sure it does, it’s not like those are mutually exclusive. By eliminating the viable options, science tells us how to read the text. I think whether this is a Gospel issue depends on how one defines “Gospel issue”. Based on your definition, J. W., I would agree. Personally, I think the Gospel is about good news of the salvation available because of Christ’s work. I have sinned against God, need a Savior, and He has fulfilled that for me. The specifics of why I sinned in the first place are secondary. The historicity of Adam may be a “bad news” issue, but it is not a “good news” issue. If the first chapters of Genesis were not there, the rest of the Bible would still teach that we all have sinned, that we all go astray, and that only Christ’s work is sufficient. I have a much bigger problem with the issue of the first sin not being attributed to Eve. Often this is done by claiming some sort of federal headship for Adam, meaning that he was really responsible. But the narrative clearly describes Eve’s actions first. Adam may share responsibility, may even have sinned greater, but neither of those take away Eve’s sin. The idea that anything other than Christ’s work can deal with our sin, seems to be a huge Gospel issue, IMHO. Incidentally, why do you describe Jesus as the “second” Adam, and why do some here state that that is how Paul describes Him? In 1 Corinthians 15:45, Paul calls Jesus the “LAST Adam”. There’s a big difference between the two, yet it seems much more common to quote the popular phrase than to quote Scripture. See vs 47 where Scripture refers to Jesus as the “second man”. Since Jesus has just been called the last Adam and since the comparison is with the first Adam then it makes perfect sense to say that Jesus is the second Adam. Scripture itself says sin cam into the world through one man, Adam. See Romans 5. Yes, Eve sinned… But the federal headship is real. If your view of federal headship means that Eve still sinned, then that makes it less of a Gospel issue. I’ve seen people make statements that his position actually removed her sin, which is what seems wrong. Interestingly, the references to Adam in Romans 5 use the more ambiguous term for humanity (anthropos), rather than the term that is specifically male (aner). The second use in 5:12 is sometimes even translated “people” because it clearly does not refer to only men. Is there anything in the Greek that mandates that the first use in 5:12 refers specifically to a male, rather having to read that into the word based on context? the text doesn’t seem to mandate the equivalence. It’s amazing to me that so many in this debate think it’s adequate for their position to merely point out what is or is not “mandated” or “essential” or “entailed.” Walton, Longman, et al often argue the same way. Think about, Jim… what IS mandated by any text of Scripture in *that* sense? Not even the physical resurrection of Jesus or not even that Jesus was a historical figure. After all it COULD be the case that all the New Testament writers are speaking metaphorically. So the entire Bible doesn’t “mandate” in some logically strict sense that Jesus is an actual historical figure. And isn’t this just what Tildeb tried to do above? He just took your same logic and extended it. Of course it’s possible that after talking about Adam as the first man and after talking about Jesus as the last Adam that Paul has no totally abandoned that train of thought and now means some totally different man in the phraseology “second man.” But who in their right mind, not grasping at straws to save their pet theory, would read the text that way? What Bible scholars or commentaries read the text that way? What we see are some Christians going through exegetical death throes in their attempt to marry science to Scripture. Remington, you made the assertion that “second Adam” followed from your use of the two statements. That is true only under certain assumptions, not held by everyone. That’s why the statement is not independently mandated. I’m not claiming that Paul changed his train of thought, only that he was talking about two different facets of the relationship between Christ and Adam. That is completely different than figurative interpretation of other New Testament passages. Here is an important way that other New Testament accounts are different: They are the result of eye witness, and are stated as such. Investigated, touched, not stories that were made up. The idea of witness is woven through Scripture as a key way God makes Himself known to people. That difference creates a sharp distinction between the Gospels and Acts, for example, and the elaborate arguments in Romans. If you honestly don’t understand the spiritual significance of witness as it applies to Scripture, and don’t see a difference between those types of passages, then we are unlikely to stop talking past each other. The fact that your primary method of argument is to bring out this very common scare tactic, leads me to think that that is the case. Similar can be said for taking my observation about Romans 5 to a ridiculous extreme as a way to seemingly rebut it, without actually answering my question. Remington, you made the assertion that “second Adam” followed from your use of the two statements. That is true only under certain assumptions, not held by everyone. What are those assumptions and what are the other assumptions people would hold which would mean Christ is a “second man” but Paul doesn’t mean where “man” doesn’t refer to “Adam”? And also how would they justify these assumptions that lead them to think the “man” is someone other than Adam given that Paul clearly refers to Adam in the surrounding context and given that the “first man” mentioned in the same sentence can’t be anyone other than Adam? Surely you can’t get any mileage out of “anthropos” since this can refer to both people generally and men (man) particularly and since the same exact term in the same exact sentence is applied to Jesus, who you think (based on your assumptions) is a particular man. Here is an important way that other New Testament accounts are different: They are the result of eye witness, and are stated as such. You fail to see that this statement is completely false unless you first *ASSUME* that these are not metaphors. But my point was it’s perfectly possible to account for all the language about Jesus in terms of metaphors. So there is nothing that “mandates” a non-metaphorical understanding of Jesus. If you think that’s a “scare tactic” maybe you should ask yourself why that scares that you. And calling it a “scare tactic” won’t change the fact that it’s true. Taking the language of Adam in the NT and saying it’s all metaphorical is a ridiculous extreme in my observation. You claim that I took your position to a ridiculous extreme. Ridiculous extreme *to who*? In fact, you’re the one engage in cheap tricks to avoid dialogue. Dismissing my points as scare tactics and “ridiculous extremes” to avoid addressing them. Context is good enough and context determines word meaning 90% of the time. The fact that we can’t mandate a word meaning like “a man” rather than “people” when we strip away all context doesn’t tell us anything significant. Every word has a semantic domain. If this is your escape route for finding a way to dismiss Adam, then be consistent, Jim. Apply that same logic to every word. Is there anything in the gospels that mandates Jesus is a historical figure in John 1:1, rather than having to read that into the word based on context? Its exactly because your methods are so short-sighted that they give themselves away as ad hoc attempts to get to the conclusion you want. This is why I call it exegetical death throes. The first part of Romans 5:12 mentions the the entrance of sin and death into the world, as opposed to the spread to the rest of mankind. Are these necessarily the same thing? If not, and sin’s entrance was a minor point relative to its spread and subsequent dominance, then even if the focus of Paul’s subsequent description focuses on Adam, that first mention could preserve the ambiguity related to Eve’s sin without having to negate it as the first example of human sin. My point in stating that it was interesting, and to ask about the Greek, was basically to ask the question of whether it is strictly necessary to conflate the entrance of sin, and its spread. The point about witness is that, whether or not one takes all passages figuratively, it seems a clear spiritual principle that witness is to be taken seriously. If one then applies that spiritual principle to the text, the difference of those that claim witness becomes clear. However, while I consider this to be a spiritually valid observation, it may not be exegetically necessary. Regarding second versus last Adam, of course they both refer to Jesus. But they are presenting slightly different perspectives. Simply because both terms refer to the same person does not mean one can casually swap words around. If I were speaking of the decline of the Mohicans, I might speak of someone as the “last Mohican”, and in the same context describe them differently as the “second American”, but it makes no sense to necessarily describe them as the “second Mohican” unless there were some other reason to make that new assertion, even when describing the same person.